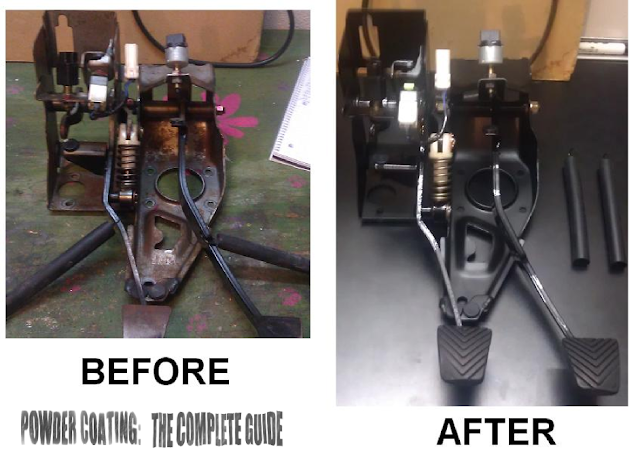 I am going to take a break on explaining the types of tools needed for powder coating and discuss powder coating from a car restoration standpoint. I am in the middle of a car restoration myself. 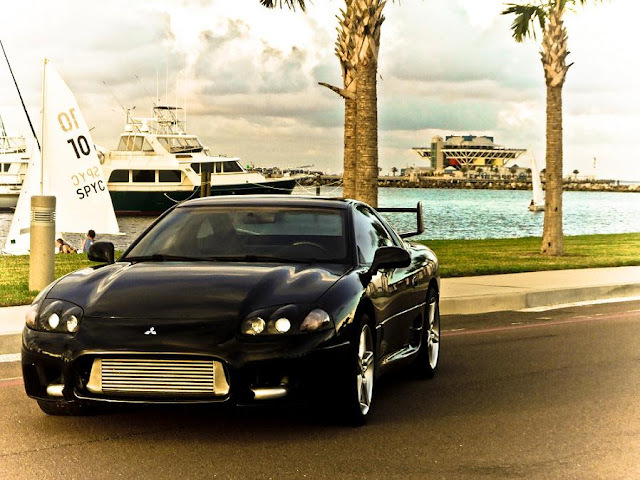 My car is a Mitsubishi 3000GT VR-4. I learned to powder coat for this car and powder coating will play a major role in making this car look new and keep it that way for many years. Because powder coating comes in so many colors, shades and textures, it can match basically any finish possible. 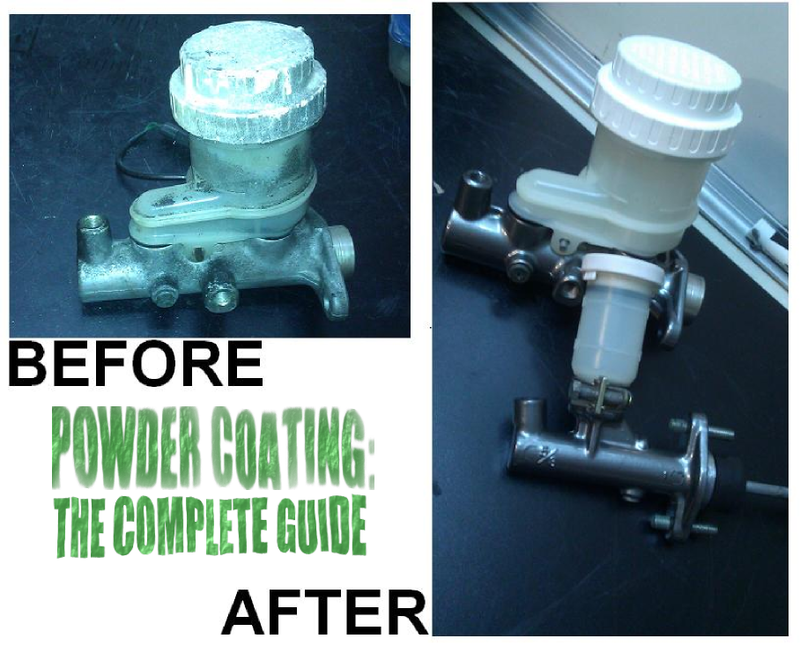 Even if you have a 60's era muscle car and would like a completely concourse restoration, powder coating can be used to match those original finishes. When doing a car restoration, you more than likely have an abundance of parts that look old. The cast iron and steel parts probably resemble a ball of rust, and the aluminum parts are likely stained and oxidized. Above is a housing for a radiator fan resistor. It consists of 2 small simple parts. For anyone restoring a car to either brand new show room condition, or their own take on what brand new should look like... the condition of this part will not do. You can spray paint it. Spray paint is cheap and easy to apply.. BUT spray paint not only has a cheap look to it, but its durability is lacking. It is very easy to scratch or chip and because it is so easily damaged, it gives rust a chance to start, and spread. I have yet to find a spray paint that I can't dig into my fingernail. You can paint it using a 2 part automotive paint. This is a great option for durability and it will look great. The paint will also prevent rust from forming underneath of it for many years. BUT this type of paint is expensive. Assuming you do not want to paint every single thing in your car one color, you will have to order a pint or quart of each color. Well a pint of paint runs about $30 for a good brand, then add the hardener for an other $30, do you want the part flat, semi-gloss, or really glossy? That is 3 different clear coats right there, and clearcoats need their own hardeners. Luckily, primer is pretty universal. You are looking at more than $100 for each color or gloss-level that you want for your parts. Now after you buy all these paint materials, you must apply several coats primer, paint, clear all while waiting and cleaning out your paint gun in-between. It is very labor intensive and you will spend a lot of time to paint just the one little bracket above. You can parts in batches to save time, but you are still looking at a full day worth of work. You can also have it plated in chrome, zinc , nickel, cadmium, etc. Well chrome is expensive but if you want it to look like chrome, chrome plating is your only option so I am sure you are willing to pay the price. The other plating methods can be done by a plater or even by yourself with a kit from Caswell Plating or Eastwood. If you decide to take them to a plater, they will have a minimum order price. That one bracket above will cost the same as 100 brackets. So if you want to take all of your parts in at once, its a viable option and not a bad one. Each type of plating has its advantages and disadvantages. Just remember, the part above is zinc plated from the factory and that is what it looks like now. Finally, the magical solution it would seem. You can powder coat it. Powder coating looks great, is extremely durable, and protects the metal from rust. Say you want this one part to have a nice gunmetal color and only this part. A 1/2 pound of powder runs about $7, clear is another $7. So $14 and you have all the supplies necessary to coat this part. Because I did not mention tools required(and the prices of them) to apply the coatings in the above methods, I will not mention it here either. All of the methods would require media blasting or at least getting the part down to clean bare metal so we will assume the part is media blasted before hand. So you have your freshly blasted part above, shoot a coat of powder on it, stick it in the oven for 20 minutes(5 minutes for the part to get up to temp), let it cool and your done. Or for the specific color shown below, it also needs a clear, repeat the process for the clear coat(another 22 minutes later) and it is done. Less than one hour of time spent, and $14 in materials(which there are still plenty left of) and the part is done and has a beautiful finish that will last for 20+years. Alternator rebuilt and the housings powder coated in Bonded Black Chrome. Hi, what is the name of the white powder paint you used for the top part of the brake master cylinder and clutch master cylinder? It looks great! Hey Sara, thanks for the compliment. The lid is actually not powder coated, it was just thoroughly cleaned with a pressure washer. The part that is powder coated is the actual metal cylinder. The color used on that is bonded black chrome and then it was clear powder coated. Do you let it cool, and then clearcoat? Or do you clearcoat after the color has baked for 20 mins and put straight back in? Yes, I always let the part cool before doing a 2nd coat. The only time I will ever shoot a part hot is if the part has an extreme recess and heat is the only way I can get the powder in it, even then, I only heat up the recesses area with a torch, not the entire part. Do I really need to put clear over my newly coated white wheels? Probably not, clear is only required over a powder that specifies that it is required. 99% of the chromes require a clear. I have yet to see a white that requires a clear. That being said, clear is never a bad idea as it adds an extra layer of protection. This is awesome work. I have read the article and it seems to me very innovative indeed. Want to really see some more update here. Keep it up man. Thanks for the comment, always good to hear. I have several articles lined up. Just need to find some more time to get them written up. The last couple of articles I wrote took me about 10 hours each since I am trying to improve the quality to make them even better and I have started doing some graphics for them. Stay tuned though, they will keep coming. Sadly, this site is still in its infant stages compared to what my future plans are. Both powders are from Powder by the pound and they recommend a partial cure on the zinc primer, then remove (let cool) then apply the final coat and do a full cure. For reference I'm a hobbyist who has access to a powder coating booth and oven at TechShop which I'm a member of. They have a Eastwood dual voltage gun. Hi, in your experience, have you powder coated a car radiator before? If no, is it possible to do so?